We run classes in Letchworth on Wednesdays (click here to visit the class web page) and in Oakwood on Mondays (click here to visit the class web page). 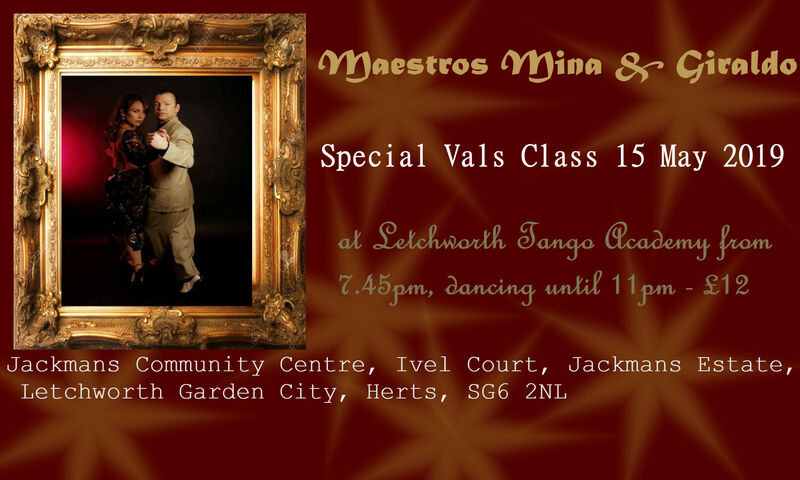 Letchworth: Classes from 7.30pm followed by dancing and music until 11pm. Oakwood: Classes from 8.00pm followed by dancing and music until 10.30pm. Please wear comfortable clothing,if you have practice shoes or any shoes with leather or suede sole those would be good however any flats would do. Always have time for everyone in a very friendly atmosphere. Organisation, especially warm-up first & Practica after Very clear instructions & demonstrations Teachers enthusiastic and strict, yet warm & friendly. Also generous. Milongas are friendly, with delicious food. The classes are followed by dance session when you can practice what was learnt during the class. The teacher also sometimes dances with the students. Excellent value. You put a lot of heart into it, which creates a wonderful family-like atmosphere. Good points on tango technique as well. Based on technique, excellent instruction, welcoming environment. Relaxed atmosphere & excellent tuition. Not been to classes yet, but Milonga very friendly, well organised, nice floor, good floorcraft and music, high standard of dancing, plus lovely nibbles and tea/coffee. I liked the techniques taught; the friendly atmosphere; variety of style and music; being made to feel welcome. Proper instruction and guidance based on technique, not moves. Thank you so much for teaching us over the years, Oscar and Sofia. Privileged to have known you and sad you’ve had to leave South London. Excellent classes, with good teachers and great value. Excellent teachers, learnt most since I am learning from Oscar y Sofia! Thank you! Copyright © 2019 Letchworth Tango Academy. Powered by WordPress. Theme: Accelerate by ThemeGrill.